Good morning @Diabolix . Thank you for putting us in the picture. (b) @spin was the only CTWUG official who expressed interest concerning the status of the problem. There was certainly no impatience expressed in said question. On the contrary, I suggested there are many members (including myself) who would be willing to assist. I realize Admins have lives of their own and we all appreciate the work you do on our behalf, but is it too much to ask that you give us feedback on what (if any) progress is being made? Any feedback with regards to Titan and when it might be back online? 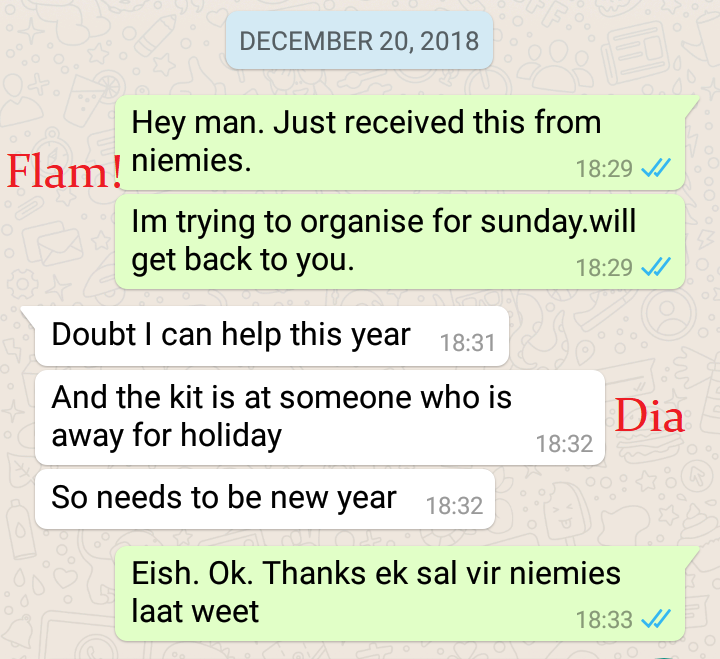 here is what was said between myself niemies and dia. i was waiting for a reply to tell me what time to meet him at the site. Can we as clients on this highsite perhaps move to another highsite as it does not seem that this issue is going to get resolved. We had multiple people offer assistance in this thread, yet the issue does not seem to be a willingness to resolve but rather an issue with gaining access to the site. 100% patience is always a good thing, but it has been over a month already. Do a 360 scan amd post results in a new thread. Thank you @angryplum for proactively pushing the urgency of getting Titan running again. Understandably, some wuggers are losing confidence. (b) The likelihood that access to the site will continue to be a problem for the foreseeable future? @razor1 : for roughly the first three years that i was a ctwug member, helping guys install/upgrade their towers. 80% because i love climbing and 20% because that is what a community is, i myself wasn't connected to the wug (IAH i did have wug @ the office). so 3months going without certainly isn't nice, but i wouldnt leave over it. even though titan is a bit unreliable, it is literally my only option to connect. there are no real other HS available. and moving to the lower building would alienate node "hrcblade" i think, as well as the guy close to groenvallei. 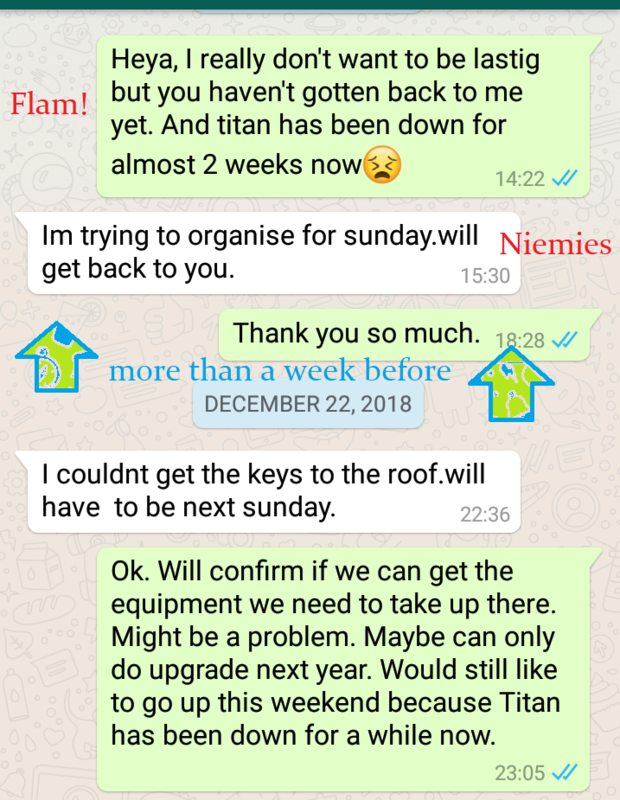 @iBeast and @razor1 as you can probably see there are only two admins trying to maintain and get Titan back up and running. Since we acquired the site a few years ago, no one in the area has been trying to get more links out or build new high sites. If that isn't the case then I apologize. It seems like everyone only relies on about 5 people to maintain and expand CTWUG and the rest sits behind their keyboards typing away. The above reasons are why me and most likely a lot of other admins are taking a back burner, we are just freaking tired. Even with the above, I will work with @angryplum to try and get the site back up and running. Hi @Diabolix i would like to assist if you need help. @Diabolix: Thank you for being so frank about the root of the problem. Like @angryplum, @TheStalker and others, I would like to offer my assistance too. I am confident there are many wuggers relying on Titan, who would be willing to help, if we just ask. Please let us know what we can do to help. Hey did anyone checked for other possible sites? Site visit has been booked for the 9th of February at 10am. Extra hands and tools will be appreciated as we need to mount the new pole and brackets. Still waiting on some helping hands. We need a strong cordless drill as well if anyone has one. Good morning @Diabolix. I will certainly be there to help. Can you confirm where we must meet? I understand @angryplum and @TheStalker have offered their help. Fellow wuggers: If anyone else can help, please respond to @Diabolix. We can all meet at the front parking lot. Let's make it for 9:30.